Last week, a generous reader, Alberta, shared a set of photographs that allowed us to marvel at the tiaras currently on display in The Splendour of Power, an exhibition at Koldinghus in Denmark. This week, our second post on the exhibition features additional Scandinavian royal jewels on display. 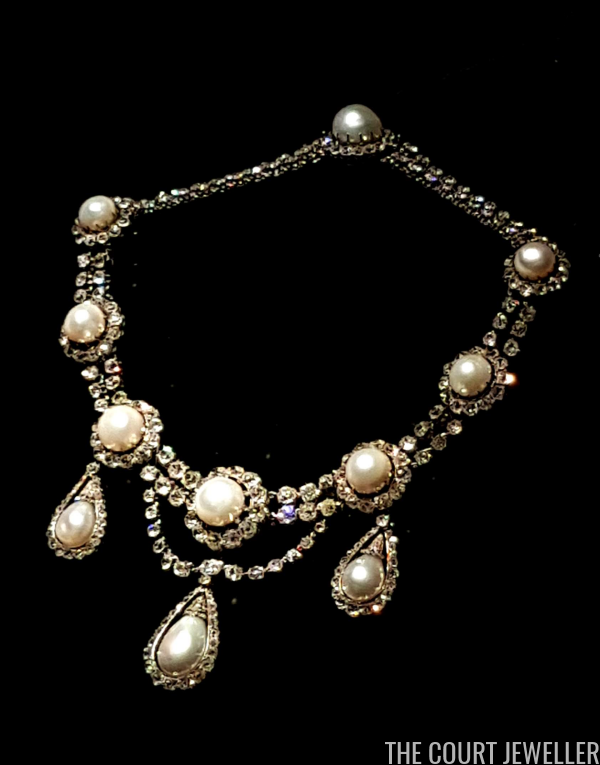 This luminous necklace of pearls belonged to Queen Caroline Matilda (1751-1775), the consort (and first cousin) of King Christian VII and sister of King George III of the United Kingdom. (You may have seen her rather tragic life story depicted in the 2012 film A Royal Affair.) They are displayed alongside a pair of her earrings, which feature gem-set bows with a trio of pendant drops. In contrast, the exhibition also includes a pair of diamond-studded gold Marianne Dulong earrings from Crown Princess Mary's collection. 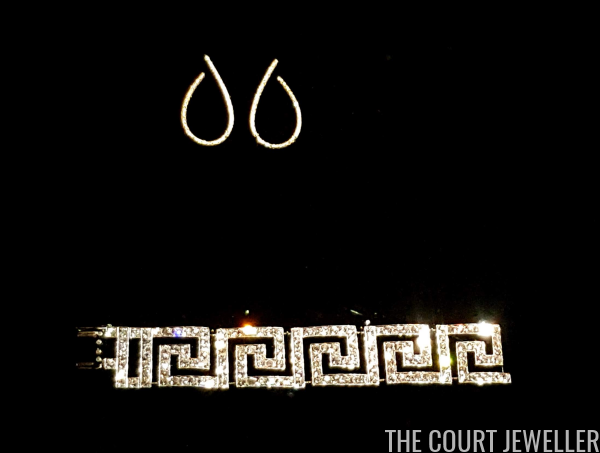 They are displayed alongside the stunning diamond meander bracelet that belonged to Queen Alexandrine. It's now worn by Countess Sussie of Rosenborg. 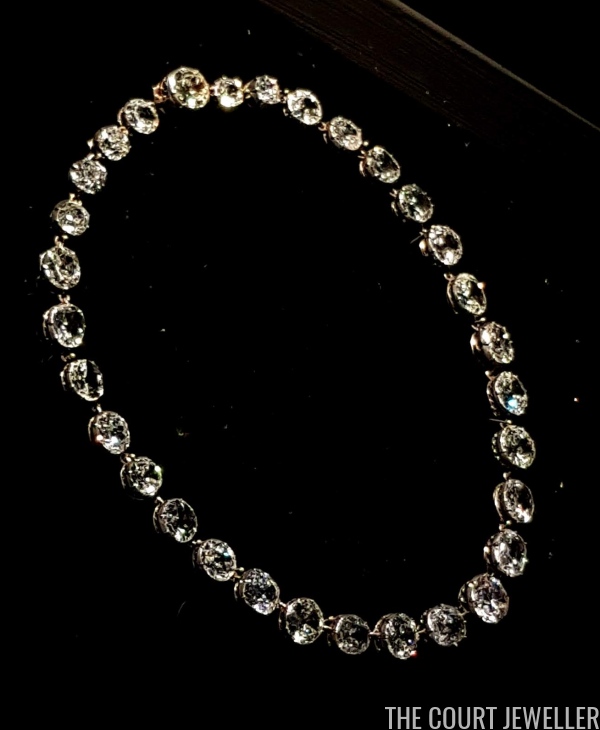 Princess Benedikte loaned another piece from Queen Alexandrine's collection: her portion of Alexandrine's flexible diamond sautoir. The necklace is displayed with Benedikte's diamond floral pendant. Both pieces were wedding gifts from her parents. One of the simplest -- yet most important and glittering -- heirloom jewels on display is the diamond riviere that belonged to Princess Anne (1709-1759), who was Princess Royal as the daughter of King George II of Great Britain and Princess of Orange as the wife of Willem IV. The necklace came to Scandinavia with her great-great-granddaughter, Louise (1828-1871), who married King Carl XV of Sweden in 1850. Their daughter, Queen Lovisa (1851-1926), was the consort of King Frederik VIII. The diamond riviere isn't the only important jewels from Lovisa's collection on display. 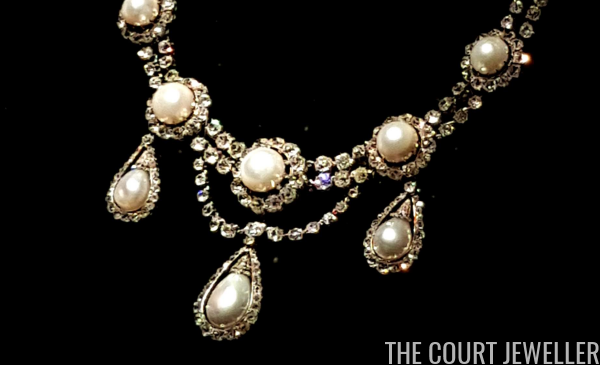 One of the grandest non-tiara items on display is the pearl and diamond necklace that is grouped with the family's married parure of pearl jewels. 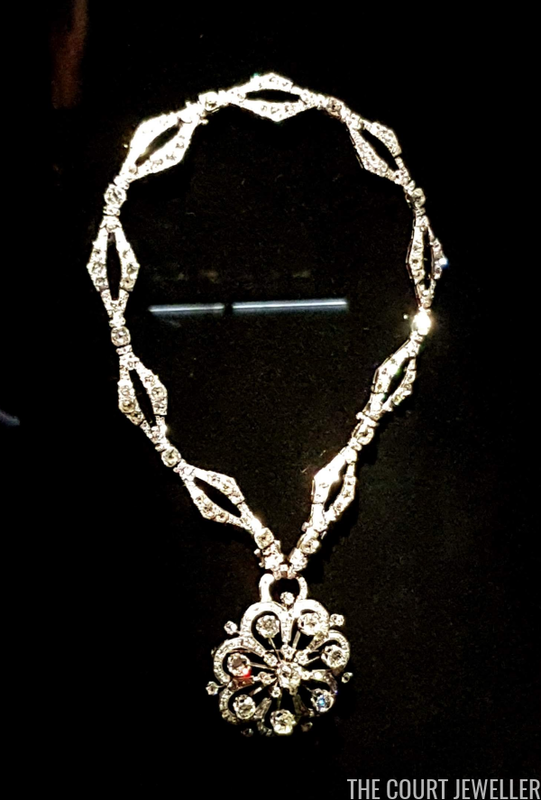 The necklace was presented to Queen Lovisa by Isma'il Pasha, the Khedive of Egypt, as a wedding present in 1869. 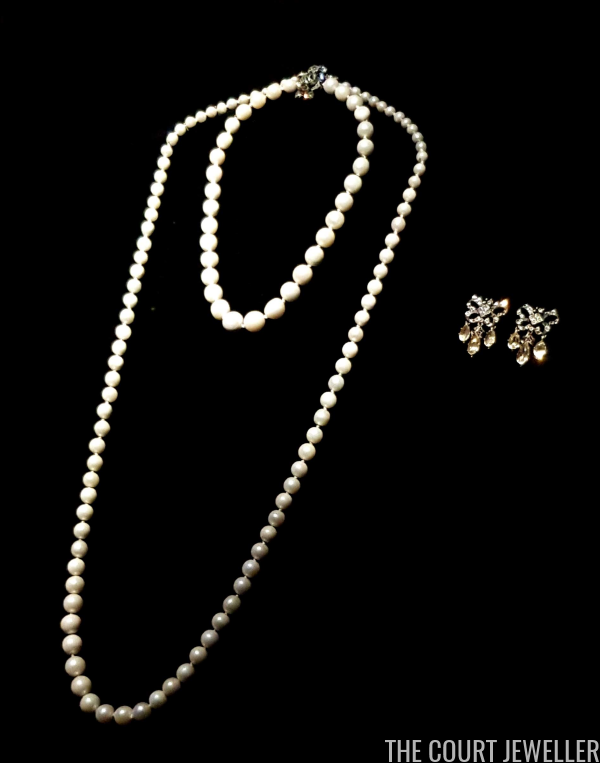 The piece originally had two more pear-shaped pearl pendants; those were removed and remodeled as earrings. The necklace (and the rest of Lovisa's diamond and pearl jewels) are now in trust and pass from monarch to monarch. 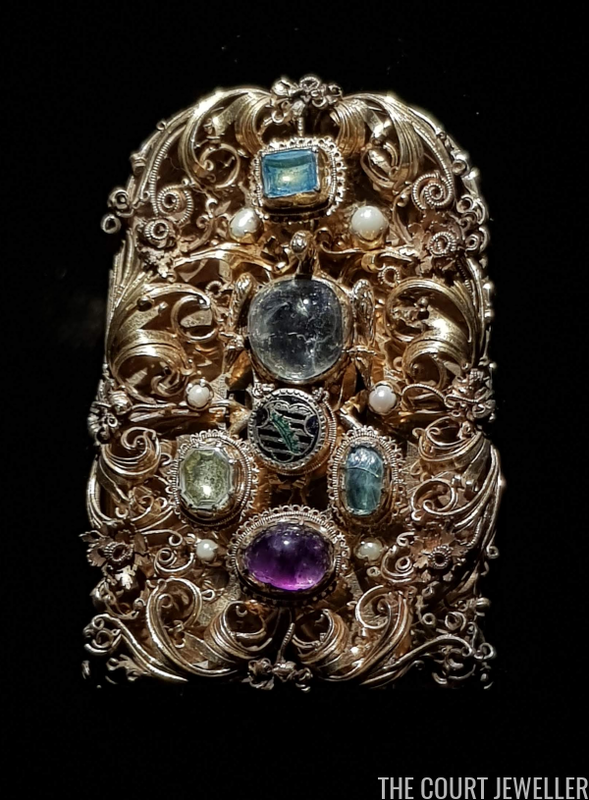 This elaborate jewel was given in 1557 by Dorothea of Saxe-Lauenburg (1511-1571), the consort of King Christian III, to the city of Copenhagen. The jewel was originally used as a cloak clasp. Endless thanks to Alberta for sharing her experience and photographs with all of us! Stay tuned next week for the final installment in our series on this exhibition.